Read my Norfolk Island Blog! Last weekend the car went. My partner is a car enthusiast, and for three years he has had a sheeny, shiny, S Type Jaguar parked in the driveway. Sunday afternoons were a favourite time to tinker. When we decided to make our seachange to Norfolk Island there was always going to be the issue of what to do with our cars. Do we take, or do we leave behind? After some deliberations we decided to take mine as it is a sound 2007 Volvo, in excellent nick and worth the approximately $4000 cost to transport. Regarding the Jag, however, he remained tight-lipped, undecided. I could tell that the pain of parting was going to be great, so I stepped right away from even mentioning the ‘J’ word. There was no way that I was going to be the influencer. The island roads are as potholed and bumpy as the island politics have been of late, although there are efforts being made on both scores. It’s a conundrum on such a small rock like Norfolk. Getting the metal or aggregate to make and repair paved roads entails digging it up, and no one wants to quarry the idyllic rolling countryside. There are no big spaces ‘out there’, out of sight, where you can acquire the material to satisfy the continuing demands of road building and repairs. There have been a few different quarries around the island, notably, and historically, where the Norfolk Island Golf Course at Kingston now stands, and at Cascade near to the jetty on the north of the island. For the time being there is a stockpile of rock near the school, which will eventually be levelled to form a new school oval. With more than 120 km of road – 78 km of these paved but mostly without curbs – that is a truck load or two of material needed for maintenance, let alone new roads. Estimates back in 2014 suggested that 110,000 tonnes of rock were required to upgrade the road system. And in 2015, 30 per cent of the roads were rated as being ‘Condition 2: Urgent attention needed’. Whichever way you look at it, supplies are scarce, and the roads remain degraded. The other factor for my partner to consider was that his Jag is a high-powered car. There are few stretches of straight road on the island. Possibly the longest is Queen Elizabeth Avenue, but, even in that kilometre or so stretch, getting above fourth gear is rare. One of the more charming aspects of island life is that cows have right of way. And they can make a nasty mess of your radiator. 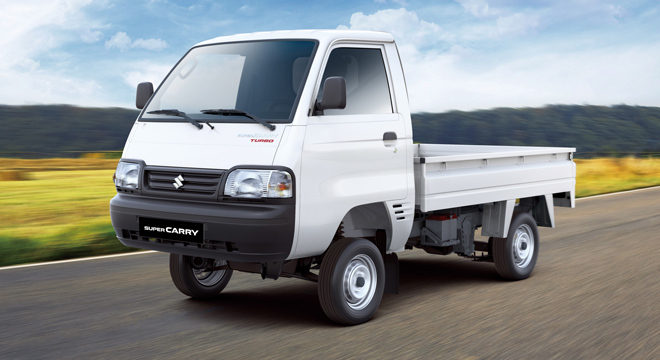 In its place we will purchase a more sensible workhorse, also known jokingly as the Norfolk Island wheelbarrow, a little Suzuki Carry Truck. If we are feeling flush, and possibly as poor compensation, we may get one with a tipper tray on the back, so he can play around with moving ‘stuff’! Don't miss a story. Subscribe to my blog here. latest adventures as we settle in to life on Norfolk Island. If subscribing to an email newsletter you may ‘unsubscribe’ at any time from the newsletter mailing list. Email addresses will not be added to any other mailing lists. The Naked Editor respects your privacy. I hope you enjoy our adventures! Visit Susan's professional website, Write-now!